This year’s Midwest Podiatry Conference themed Adapt. Evolve. Change. was a success! Allied OSI Labs exhibited again this year at the Hyatt Regency Chicago, April 3-6, 2014. The Midwest Podiatry Conference is one of the largest in the industry with more than 2,000 doctors, physician assistants and exhibitors in attendance. This conference is the place to showcase new trends in podiatry, meet up with knowledgeable professionals, exchange ideas, and capture the imaginations of podiatric specialists. The Exhibit Hall is where it all happens; learn, share, and grow as a business and as medical professional. 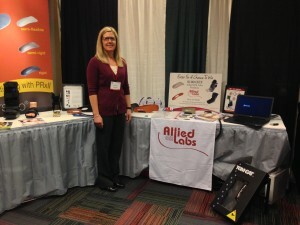 Allied OSI Lab’s industry veterans Sandie Lambert and Kathy DuBois were on-hand to answer questions about our custom orthotic and Richie Brace lines, as well as demo our new Tom-Cat Foot Scanner. Also, the new Doctor’s Choice DME products were very well received. We particularly enjoyed connecting with many of our current customers at the booth. We held a drawing for $100 in free Allied OSI Labs products, and we are pleased to announce the winner, Dr. Shireen Lum of Chicago, IL. Congratulations Dr. Lum! We had time to take advantage of Chicago’s variety of restaurants and enjoyed the iconic skyline and incredible lakefront view. We thank our customers and colleagues who make the MPC a great gathering year after year. Next stop, Oklahoma City, for the Oklahoma Podiatry Medical Associations Spring Symposium.